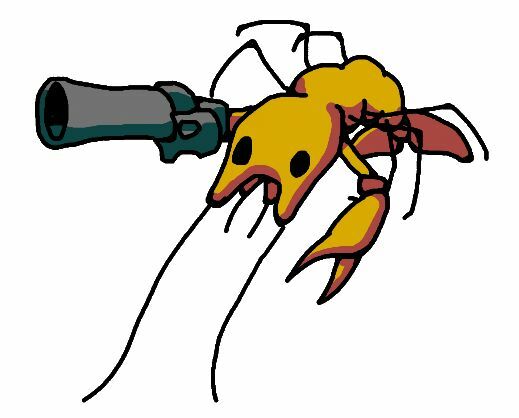 #770: Pistol shrimp can make a noise loud enough to break glass. Alpheidae is a family of caridean snapping shrimp characterized by having asymmetrical claws, the larger of which is typically capable of producing a loud snapping sound. Other common names for animals in the group are pistol shrimp or alpheid shrimp. That "snapping" characterization is a serious understatement. According to the previously linked BBC video, the "flash point" of the snap heats up the area - for a split second - to 4000°C. That is not a typo. This super-heated "bubble bullet" can travel as fast as a car and often literally launches their prey several inches (which for a 3-5cm creature underwater is no small feat). In addition to being a tool of brutal fishy murder, according to the BBC, it is also their primary source of communication "with their innumerable neighbors, each tucked away in it its own den in the soft sand." The sound is so loud, that it has become a staple "noise" under the ocean and is often, according to the same BBC article, described as "snaps" underwater or like the "cracks" of burning tinder. Between 1944 and 1945, the US Navy deliberately used snapping shrimp colonies as an "acoustic screen" to hide from the underwater hydrophones in Japan's harbours, allowing their submarines to enter undetected. The shrimp might even have had their own part in early atom bomb tests on Bikini Atoll. Basically, they are so loud and so prevalent that the military used them to as a "noise cover" on multiple occasions. So there you have it. These little desperados are awesome. Have a good rest of your week and (an early) Happy Mardi Gras!